More versatile than a mouse, faster than a keyboard and always on call: your own voice is an exceptional computer input method. But, for years speech recognition has fumbled along without attracting much of a mainstream audience. However, recent improvements in language dictionaries, microphone technology and a growing desire among mobile professionals to become untethered from the constraints of a touchpad and keyboard now make speech recognition more viable than ever. With such vast improvements in the field of speech technology, What Laptop magazine decided to take an in-depth look at what's on offer and what it means to the modern laptop user. Once you try speech recognition features, you may never use your keyboard again. One clear sign that speech has arrived for mobile users is the latest release of NaturallySpeaking. Created by Nuance Communications, the product recently became available for 64-bit operating systems. However, the biggest advancement has to do with the Nuance language dictionaries. Speech technology is an advancement that gets better with age – the dictionaries become more robust, capable of understanding more words, dialects and speech patterns. With Naturally Speaking 10, you can dictate a business memo and expect that your laptop will accurately type what you say, instead of just transcribing the basic gist. This has several advantages. One has to do with simple ergonomics. Wearing a headset, you can move around the office, make coffee, or lounge on a comfortable chair while you speak. Another is that you can usually speak faster than you can type – especially once you train the software by going through several speech learning modules. Hard to believe? In a hands-on test, we used NaturallySpeaking 10 to speak words at a rate of about 100 words per minute, compared to a 60 words per minute typing speed. (Nuance claims most people type 40 words per minute and speak 120 per minute.) The software is now more accurate than previous versions, such that it becomes a 'natural' part of your day. New features of NaturallySpeaking 10 include using the software to speak commands. You can also add custom words to the dictionary. There's a mobile version for Windows Mobile devices as well, and the software even includes a bundled headset. Microsoft has improved the speech recognition options in Windows 7, primarily by adding to the language dictionaries, but also by adding new features. For example, there are new settings for text-to-speech translation – which speaks selected text. The Anna voice can speak at variable speeds, and eventually you will be able to add voices. 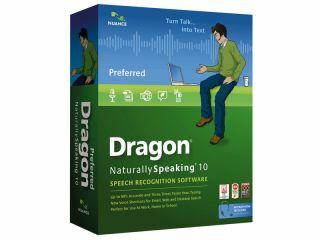 Speech profiles allow you to configure microphone settings and use learning modules that are similar to those in Dragon's NaturallySpeaking, in that the speech recognition system learns your speech pattern and adjusts to it for better accuracy. There are settings for allowing Windows 7 to review documents and emails you are dictating and improve accuracy. In several tests using the RC1 build of Windows 7, speech recognition worked slightly better than it did with Windows Vista. The laptop you use is an important factor. On a Dell Studio 15 with a fast processor, speech worked quickly. Yet on a slower Lenovo ThinkPad X301 with an ultralow voltage processor and 2048MB of RAM, speech would stall slightly during intense speech-to-text sessions. That said, Windows 7 does get speech recognition right. It's easy to see how the technology will work on newer Tablet PC models, such as the Dell Latitude XT2, which also supports touch control. Eventually, computers will be able to understand our speech patterns and respond to touch in a way that makes a mouse and keyboard seem old-fashioned. In the future, mobile devices will be more prevalent in our cars, kitchens and living room and will be integrated into the workspace in offices – having one built into a conference table, for example, where there is no other input device than your voice and fingers. It means the very definition of a computer will change – a computer will not be contained in a mobile device you carry around, but will be part of the infrastructure around you. Say you want to 'type' a letter. You can say a command such as 'new document' in your home and start speaking to have the 'computer' take it all down for you. It's unclear how Windows 7 will evolve to support this infrastructure change. Most embedded computers these days are built on Linux – and speech recognition is far behind Windows on that platform. Likely, there will be 'light' versions of the OS that only support speech, touch, documents, the web, email, and other limited activities. In this future scenario, it is unlikely anyone will be creating engineering diagrams with just their voice, but it's not inconceivable. Windows Vista itself has built-in speech recognition capabilities. This means you might already have a speech recognition system installed on your laptop. To use it, go to Start and type the word 'speech' to see the programs available. Microsoft engineers have worked out many of the bugs associated with speech recognition – you can now correct words, speak commands (such as 'copy' and 'paste'), search the Windows help system using only your voice, and dictate entire Microsoft Word documents. The speech technology has advanced well beyond the early incarnations. In Vista, if you say a word that has two distinct meanings – such as principal and principle – the speech recognition system will stop and ask you to clarify which meaning you want. It's both fluid and powerful. Another perk of using speech recognition on your laptop is that the underlying software actually learns your own speech patterns and adjusts itself for your particular voice. Most of this speech capability emerged out of Microsoft research and made its way into the desktop operating system, testing hundreds, if not thousands, of users, and learning how people speak and how to interpret what they say. Improvements in processor speed and RAM allocations have helped, since many new laptops come with 4096MB of memory or more and run on the 64-bit version of Vista, which can access more memory.